Brazil is a macroeconomic and political hot mess at the moment, experiencing a deep recession and a political quagmire reaching to the Presidency. Despite this, after a horrendous performance in 2015, Brazil’s currency the real performed best in the world for the first quarter of 2016 surging over 10% against the US dollar, and both equity and debt markets rallied hard. This turnaround lies squarely in an anticipation that a desperately needed political transition is nearing. As has often been the case for Brazil, and emerging markets overall, both the macro and political framework are absolutely critical for determining further market moves. Brazil has suffered negative GDP growth in seven of the last nine quarters, and 2015’s overall -3.9% growth rate belies the huge contraction in the economy that is still underway (see chart below). While the shine was taken off Brazil’s “investor’s darling” status a few years ago when commodity prices began their steep decline, it has been the ongoing corruption scandals implicating a wide variety of government officials and prominent businessmen that has derailed public confidence and paralyzed the economy. Millions of Brazilians took to the street this year to demand a change. Consequently, impeachment proceedings have begun and the ruling congressional coalition has fallen apart, but the outcome is far from clear. What is clear is that the political crisis has induced a crash in the economy. Businesses aren’t investing, consumers aren’t spending, unemployment is increasing, and the central bank has had to raise interest rates to very high levels in order to stabilize inflation (and the currency). While the economy is projected to continue this negative trajectory for 2016, asset markets are likely to gyrate depending on the unpredictable evolution of the impeachment process against President Dilma Rousseff. If an impeachment occurs, it is extremely likely that Brazilian assets will rally for some time (the new president just “has to be better!”). If she doesn’t leave office, assets will likely go back to their previous malaise unless the global situation becomes so rosy that Brazil is dragged higher. Given the bleak economic outlook and the poor business climate, it is unsurprising that not many analysts confidently advocate exposure to the Brazil equity market (the Bovespa). As the Bovespa has historically been dominated by commodity related companies and those with strong government ties, it is unsurprising to see that the stock market performed poorly over the last five years. That said, commodities and oil seem to have bottomed out in January, and overall sentiment towards emerging markets has improved. Volatility is high, however. Given the likely binary outcome for returns, based on whether there is a change in government or not, it is difficult to advocate much of a long or short position at this time. For investors who have a strong stomach and want to get involved, there are many actively managed funds which own Brazil stocks (both global emerging market funds and dedicated funds). There are also ETFs that represent the Brazil stock index, such as iShares’ EWZ. Finally, many of Brazil’s largest companies have ADRs, so that investors can buy shares on the New York Stock Exchange and other global locations. Many worthy Brazilian companies are global in nature, though domiciled in Brazil. Consequently, they are driven more by global and industry factors than country ones. For example, despite being headquartered in Brazil, Ambev is currently the 5thlargest brewery company in the world, and has sources of revenues across several continents. Like the equity markets, the value of Brazil’s currency the real is highly volatile, and driven by both country risk factors and global sentiment regarding the US dollar. As the chart shows, after weakening 59% from 2012 to the end of 2015, the currency has bounced slightly in 2016. Supporting the currency are very high domestic interest rates which typically can encourage capital inflows. Brazilian economists universally expect a much weaker currency by year end and through 2017, given the poor state of the fiscal situation and the economy. If the political stalemate disappears, sentiment alone could overwhelm these negative drags. Once again, the outcome is quite binary. Foreign investors who want to bet on the currency can isolate exposure to the Brazilian realthrough ETFs such as Wisdom Tree’s BZF. Of course, exposure to domestic stocks will also entail exposure to the currency. Finally, Brazil offers a lot of fixed income opportunities for investors, with bonds issued by the government and by corporations alike. These bonds are difficult for non-institutional investors to access; however, they appear in almost every emerging market fixed income fund. Both the country and many of the companies have issued debt in US dollars, which helps alleviate the currency risk for foreign investors. As in the case of the stock and foreign exchange markets, these USD denominated Brazilian bonds have had a rocky road for the last five years or so. The sovereign was downgraded by credit rating agencies to “junk” or high yield status, which means that the credit metrics have deteriorated materially and there is an increasing risk of non-payment in the future. 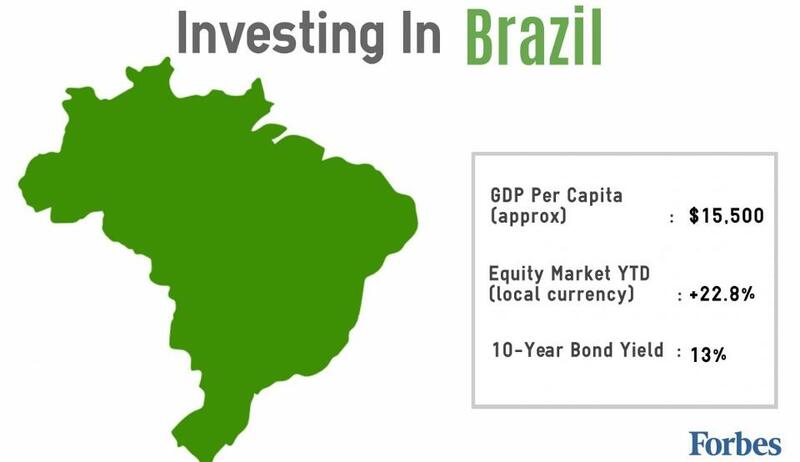 Brazilian local currency denominated bonds are also frequently traded by institutional investors. While yields are in the high teens (the 5 and 10 year bonds yield around 14%), volatility remains high, inflation is stubborn, and the central bank is still in no mood to cut rates. If and when the political change occurs, and when inflation levels off, there will likely be a significant rally in these local bonds. Overall, Brazilian asset prices have fallen so much in five years that to many investors, they look cheap. In order for a positive trend to emerge, there needs to be decisive political change that in turn corrects the weak economic and fiscal environment. For the brave who believe emerging markets have bottomed in January this year, Brazil’s political drama should be monitored as a signal to buy Brazil investments once again. This article is part of a series called “The Global Investment Guide: How To Invest In 25 Countries Around The World,” where I take readers on a voyage through the current investment landscape of the largest developed and emerging economies. For each country, I discuss the investment climate in terms of the macroeconomic and policy situations, the investment outlook across asset classes, and also indicate typical investment vehicles for accessing exposure to these countries.